If you’re searching for exterior doors that will make a statement at your residence, Main Door Corporation has the perfect solution. 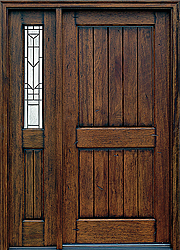 We are a manufacturer of premium doors made from solid wood with no veneers. This means that all of the doors we offer are exceptionally durable and will never peel or delaminate – an outstanding benefit when you consider the stunning beauty of their natural wood-grain patterns and bold colors. The American Red Oak Collection – With warm, rich colors and pronounced grain variations, our oak doors are ideal for homeowners who admire the natural beauty of wood. The Craftsman Collection – Featuring simple, clean lines, these doors are the ideal option for those who would like to add a touch of elegance to their homes. The Dutch Door Collection – These versatile exterior doors act as a hybrid solution by allowing you to open the top and bottom halves independently, thereby providing the functionality of a door and a window all in one. In addition to numerous door styles, Main Door also offers a range of customization options. Choose from many different stains and finishes, sizes, sidelight options, and much more to truly make your new door your own. If you’d like to learn more about our exterior doors and see them in person, simply visit one of the locations of our exclusive partner, The Home Depot, today.